Silly Boy. I’m very disappointed. We HAVE read about both Alsace and Sauternes–it was just a while ago. Also, why did you cross out “be specific” on #2–totally cheating and you get no points for your answers. And you probably thought you were being funny writing “France” twice, but that is actually correct, only you weren’t specific. We had a bottle of Vouvray two nights ago. We ate food with it. So how come you left that part of #4 blank? As for #5: Where is Sauternes from? You know this and can therefore deduce what the grapes are. Maybe I’m a bad teacher…or maybe YOU ARE NOT TAKING THIS SERIOUSLY. 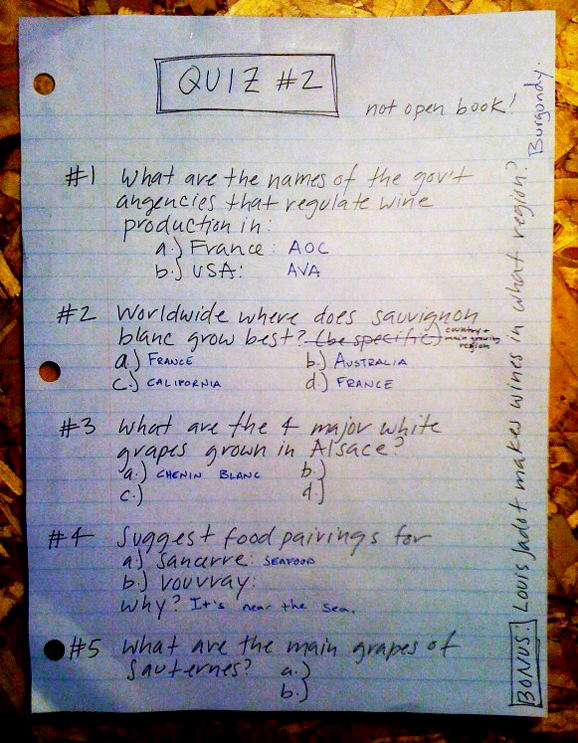 Wow, she made thIs #2 Sauvignon Blanc question even more specific? Tough Prof. Lesson: Never second guess The Prof. I formulated an answer, but I was sure I would fail. Do blends count? This is my worldwide answer: Sauternes, Sancerre, Pouilly Fume (mourning Dageneau), Trentino-Alto Adige.